Banjo Nickaru & Western Scooches have been touring with Nick Russo on guitar and Banjo, Betina on vocals and guitar, featuring reinterpretations of standards and Betina originals. Their latest release has been received well. 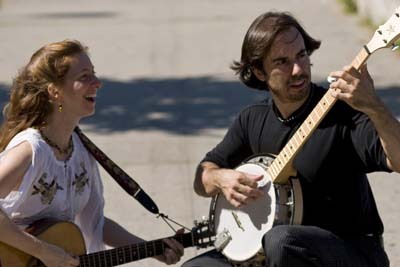 They have been touring and appearing live on radio, Woodsongs, Blue Plate Special, WFUV, and more. 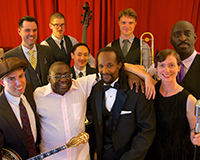 Hot Jazz Jumpers plays 1920s jazz, New Orleans, blues, and standards. Their album Very Next Thing was well received in Downbeat Magazine, London Times, and more. Beat By Beat Press where you can find Denver Casado and Betina Hershey published musicals. "Wish I Could Stay,", the first project on Betina's new label, Loping Raven Records, was recorded at John Guth's studio, north of the city and released in 2000. Jeff Ganz on bass, Jeff Berman on drums, Scott Kuney on guitar added their musicality to Betina's songs while she sang and played guitar. There were horn appearances by Shawn Hershey, Lowell Hershey, and Bruce Bonvissuto, and John Guth added ideas and played guitar and various instruments on a few songs, especially Childlike Lover, on which he is the only other musician besides Betina. For audio samples of "Wish I Could Stay," visit CDBaby.com or visit iTunes. On October 20th Betina and her husband, Nick Russo, came out with a cd called "Gettin' Married," all originals written for each other. "Behind The Scenes" premiered May 17th, 2008, with the Garden Players. Idea by Carol Hershey. Lyrics by Betina Hershey. Music by Denver Casaodo. Book by Hershey, Casado & Gwynne Watkins. 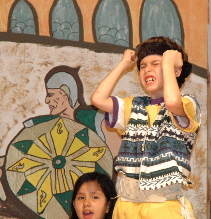 "Space Pirates" premiered May 19th, 2007, with the Garden Players. Book by Gwynne Watkins, Music by Denver Casaod, Lyrics by Betina Hershey & Gwynne Watkins. "Bounce to the Wave", a jazzy swing dance/contact improv piece with a live band premiered at Wagner College in November of 2006. Choreography & concept by Betina Hershey. Lyrics by Betina Hershey. Music by Steven Sweeting. "Finding Home", an hour long children's musical written with composer Eddie Guttman, premiered in 2005. In September of 2004 Betina was accepted as a lyricist to the Lehman Engle BMI Musical Theater Program and began writing with a very talented composer, Denver Casado. In addition to the many cabaret songs they have written and seen performed, they have written three children's musicals for the Garden Players. They also wrote a 20 minute musical, "Finding The Wonder," which won 2nd place in the 2006 BAD Musical Festival (book by Gwynne Watkins) and is having another reading done in February, 2007. "Musicville", another hour long family musical, premiered in May, 2006. Book by Denver Casado & Betina Hershey. Music by Denver Casado. Lyrics by Betin Hershey. "Lemontales," Betina's first children's musical (written with help from Matt Gough) premiered in May 2004, performed by 30 kids in The Garden Players, grades K-8th grade. Book, music & lyrics by Betina Hershey. 2018 Get Us Out Of Fearland Sophomore album for Banjo Nickaru & Western Scooches. Vocals, guitar, and songs by Betina Hershey. Produced by Nick Russo. Also on all streaming platforms. 2018 Switch It Off! Book and Lyrics by Betina Hershey. Music by Sunny Knable. 2017 Your Turn, A Superhero Musical Book and Lyrics by Betina Hershey. Music by Sunny Knable. 2016 What If? Lyrics by Betina Hershey. Music by Betina Hershey & Sunny Knable. Book by Betina Hershey. 2016 Very Next Thing Banjo Nickaru Album available on CD Baby and everywhere else! 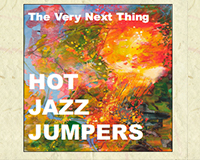 2015 The Very Next Thing Hot Jazz Jumpers Album available on CD Baby and everywhere else! 2014 Space Pirates Lyrics by Hershey & Watkins. Book by Gwynne Watkins. Music by Denver Casado. 2013 The Most Epic Birthday Ever Lyrics by Betina Hershey. Music by Denver Casado. Book by Hershey & Casado. 2011 Musicville Lyrics by Hershey. Book by Casado & Hershey. Music by Denver Casado. 2010 We Are Monsters Lyrics by Betina Hershey. Music by Denver Casado. Book by Hershey & Casado. 2009 America's Top Ensemble Lyrics by Betina Hershey. Music by Denver Casado. Book by Hershey & Casado. 2008 Behind The Scenes Idea by Carol Hershey. Lyrics by Betina Hershey. Music by Denver Casado. Book by B. Hershey, Casado & Gwynne Watkins. 2007 Gettin' Married CD Music, Lyrics & Arrangements: Betina Hershey Russo & Nick Russo. 2006 Bounce to the Wave Choreography & Lyrics by Hershey. Music by Steve Sweeting. 2005 The Big Leap Book & Lyrics by Hershey. Music by Denver Casado. 2005 Finding Home Book & Lyrics by Hershey. Music by Eddie Guttman. 2004 Lemontales Book, Music, Lyrics by Betina Hershey. Assistance from Matt Gough.